Following a five-game road trip to Montgomery, the Biloxi Shuckers return to MGM Park for ten games starting on April 15 at 6:35 pm. 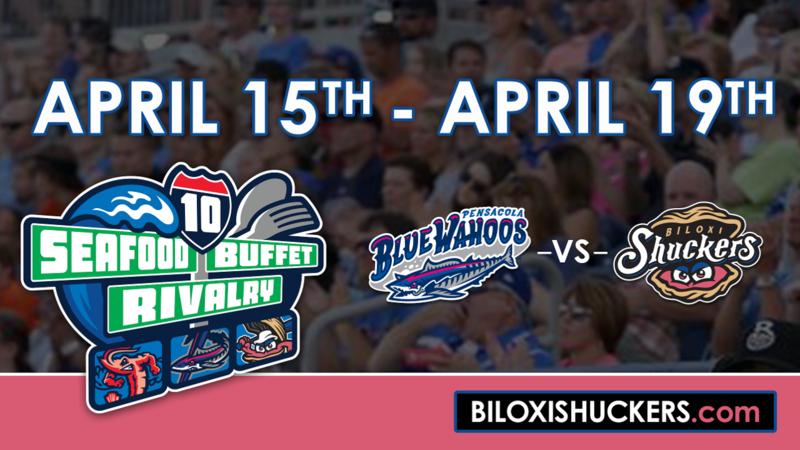 The Shuckers kick off the homestand by hosting the Pensacola Blue Wahoos for a five-game series, the first games the Shuckers will play in the Seafood Buffet Rivalry Series. Start the homestand with dogs and discounted beers on a Barks & Brews Monday. Receive $3 craft beer refills with the purchase of a Shuckers Monday Mug (20 oz. ), which includes your first beer, for just $10 at the Buena Vista Beer Garden. Taps include Lazy Magnolia, Biloxi Brewing, Parish Brewing and more. Dogs are not just welcome, they're encouraged on Mondays. Purchase a $7 berm ticket to take in the game with your pup. Arrive early to participate in our pregame dog parade on the warning track. Summer is coming. Be one of the first 250 fans at MGM Park to receive a special 'Game of Throws' Shuckers themed t-shirt, courtesy of Coca-Cola. Fans can also purchase tickets for the Beer Garden Bullpen Seats, located at the top of Section 114 right in front of the Buena Vista Beer Garden. Tickets are $15 and include three, 4 oz. samples of select craft beers from the Beer Garden. It's the first of four One Coast Wednesdays at MGM Park as the Shuckers celebrate the city of Gulfport! Businesses from the city of Gulfport, including Two Men and a Truck, Dawg House, American Cancer Society, Direct Auto & Life Insurance, AMR, Mississippi State Port Authority, Mr. Appliance and The Service Company will all be set up on the concourse of the ballpark. Plus, Mayor Billy Hewes is scheduled to throw out a ceremonial first pitch. Enjoy an all-you-can-eat special on Wednesday as well. Purchase a $20 ticket to the Community Bank Terrace, or upgrade your game ticket for just $10, to gain access to an all-you-can-eat buffet with food from Murky Water BBQ and Papa John's along with hamburgers, hot dogs and watermelon. Most other teams call it thirsty Thursday, but the Shuckers have a twin killing of a deal on Thursday night. Enjoy $2 Yuengling draft, $2 Coca-Cola and $3 draft beer specials throughout the night. Plus, $2 hot dogs are available at the concession stand courtesy of Polk's Meat Products. Purchase 'The Double Play' before the day of game for just $10 for one Reserved Level ticket and two drink vouchers. And as always, tickets are available for the Beer Garden Bullpen Seats. Biloxi finishes their five-game series against the Blue Wahoos with a bang on the second Fireworks Friday of the season. Stick around after the game for the best fireworks show on the Gulf Coast! Plus, kids can run the bases after the fireworks have concluded.